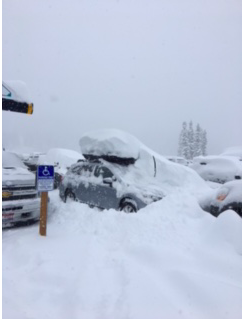 It had been snowing three days when I arrived at Grand Targhee. By morning the new snow total was 55″. A guy from Denver suggested signing up for Early Tracks. For $89 members of the ski school guide you at 8AM, an hour head start on the public. Next morning, I skied 1 1/2 hours on untracked terrain, guided by B-Rad, Wall Street derivatives trader turned ski instructor. The snow was mid-thigh. Grand Targhee is known for its deep, natural snow, and the day I was there, the resort lived up to its reputation. Like many other skiers, my previous experience with the area was taking a day trip from Jackson Hole, the mega resort about 25 miles away. 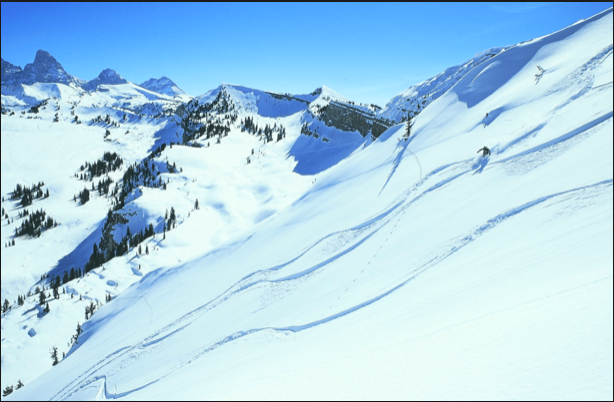 Grand Targhee’s 2,600 acres sit in the Teton mountain range, its 2270′ of vertical served by five chairs. At 7851′, the base can present a breathing challenge to flatlanders. But it’s worth the short time to acclimate. On clear days, you can almost reach across the valley and touch Grand Teton Mountain in its 13,770′ glory. Lodges, restaurants, retail, pool and hot tub cluster at the base; each a short walk from the other. The lot is an easy walk to the lifts and decent restrooms are located at the top of each chair. From past visits, I know that super-steep is not part of Grand Targhee’s DNA. This time, two hours of early morning super-deep left me wiped out. The rest of my day was at the bottom. There are three places to eat and a small general store. The first evening I ate at Branding Iron Grill, the resort’s fine dining option. A nice space, with good food, and a generous pour. Powder morning I chose something light and delicious at Snorkels, the breakfast and lunch eatery. That afternoon I sat in the very full Trap Bar and Grill, sipping a beer and enjoying friendly conversation against a background of live bluegrass. Grand Targhee’s senior pass pricing starts at age 65 and is humane. Lodging at the resort also is reasonable: a slope-side room, midweek next February is less than $200 per night. Other options are available in nearby Alta, Wyoming and in Driggs and Victor, Idaho. The vibe is friendly, with friends and strangers of all ages in easy conversation. Older locals refer to themselves as Targeezers. The mountain, reliable snow, and reasonable prices keep people returning season after season. One couple I met was visiting from Hawaii for the second time in a few months. The guy from Denver was on his second trip of the year. A couple from Australia had driven over from Jackson for the day. Next time they plan to spend to use Targhee as their base. At one point the clouds lifted and Idaho’s flat potato fields came into view. Access to this area of Wyoming is through Idaho. B-Rad pointed out some of the distant ranges while I caught my breath. Then our attention focused on what was in our immediate future: a long expanse of light, untouched deep powder waiting quietly for us to leave our lines. 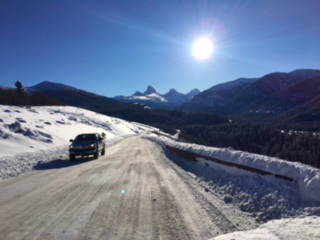 Just returned from skiing Grand Targhee for the first time.We went for Jackson Hole but only skied 2 days there. We skied 6 days at Targhee, getting snow on 4 and sunshine on first and last day. What a gem. Great prices and friendly people. 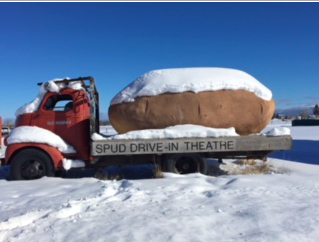 It was fun to see your picture of the potato at the drive-in.